Mix together 100g of flour, cornflour, salt, pepper and pinch of cayenne pepper, and sparkling water until smooth batter is achieved. Set aside until required. 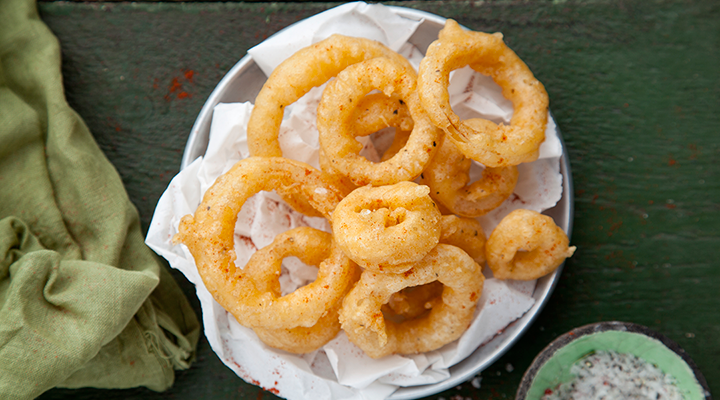 Dip the onion rings into the leftover flour. Tap to remove any excess, dip into batter and transfer into fryer. Cook for 3-4 minutes until golden and crispy. Remove from deep fat fryer and drain on kitchen paper to absorb any excess oil.